Set almost straight across from the Nan National Museum, this is the second most important wat in Nan. Not as well known as its more illustrious neighbour Wat Phumin, Wat Prathat Chang Kham is also a former royal temple plus it is thought to date from over a century earlier. It’s said to have been constructed in the early 15th century for royal ceremonies and indeed originally had the name Wat Luang, meaning Royal Wat. 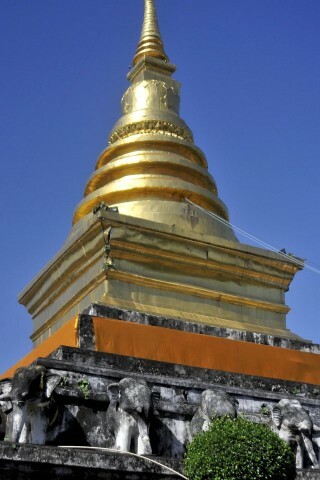 Just to add to Nan’s eclectic religious architectural mix, Cham Khang has a Sukhothai-style, bell-shaped chedi which, as the name Prathat indicates, houses relics of Lord Buddha while the large, gold-coated, bronze Buddha image in the main hall is in Chiang Saen style. The chedi is also notably surrounded by elephant images, hence the name ‘Chang’. Interestingly, also from within this wat’s grounds, an art historian found a walking Buddha statue in plaster. As he was moving it outside, the statue was dropped revealing a gold alloy Sukhothai period statue within. During the frequent Thai/Burma melees, precious icons were often coated in plaster in the hope of protecting them from marauding Burmese (who would melt them down for the gold). This spot is worth a peek and a photo or two.